The Edmonton Oilers have traded defenseman Justin Schultz to the Pittsburgh Penguins in exchange for a 2016 third-round draft pick. According to ESPN’s Pierre LeBrun, the Oilers will retain 50 percent of Schultz’s $3.9 million salary cap hit this year. Schultz’s time in Edmonton has been disappointing after he chose to play for the Oilers in a highly publicized decision to sign with the team in the summer of 2012. Schultz was originally picked by the Anaheim Ducks in the second-round of the 2008 NHL Draft, but found his way to free agency through a CBA loophole. His best season came in 2013-14 when he had 33 points in 74 games. During his four-year NHL career, Schultz is a total minus-78. This year Schultz has three goals and seven assists while averaging 20:08 minutes per-night. As our own Ryan Lambert notes, the expectations around Schultz were maybe a little too high throughout his NHL career. Perhaps the Penguins can figure out a better way to use him than the Oilers did. This is the second major move of the day for the Oilers. 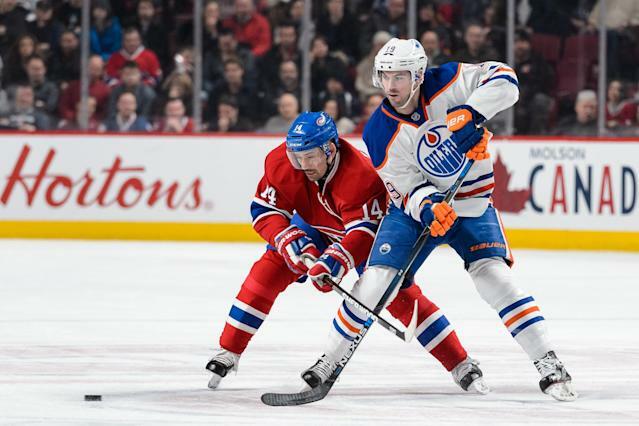 The team traded Teddy Purcell, their other major trade target, to the Florida Panthers. The Oilers had held Schultz and Purcell out their last two games to protect them from injury.